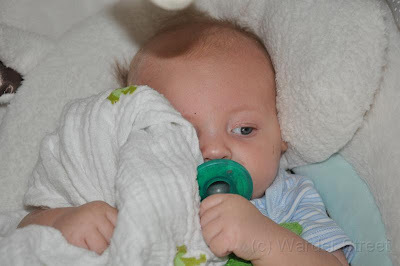 I can't believe that William is almost three months old! My little baby is getting so big. We are at the end of his growth spurt and he's now unofficially 14.5 lbs and 25 inches long! His personality shows up more and more each day. He's so funny and he loves to laugh. 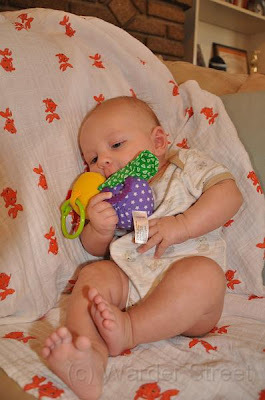 He also loves to chew on anything he can get his hands on: his fist, my hair, his toys and blankies etc. It's pretty amusing to watch him try to stuff things in this mouth. William is also discovering his voice. This has been both frustrating and fun. Frustrating because he has definite likes and dislikes now (though sometimes they seem to change daily) and he likes to tell you what he dislikes by screaming. Though it usually indicates a desire to eat or sleep there are times when we are baffled as to what he wants. But for every scream there are five giggles. He's hilarious when he's happy. In the mornings I get woken up by "Mmrrr. Mmrrr. Mmrrrr" coming from the monitor. When I go into his room he gives me a big smile and giggle!! Yesterday he actually said "GaGa" which everyone knows is baby for "Mom, I love you. You are the best!". The other night when Taylor was getting him ready for bed William managed to get his arms through his pajamas on his own. He was justifiably proud of himself and laughed and laughed. We'll try to post a video of him talking soon! He has amazing head control. He sits up pretty much on his own for short periods of time. He'd do even better if he figured out how to put weight on his arm. He's been resisting that so far! 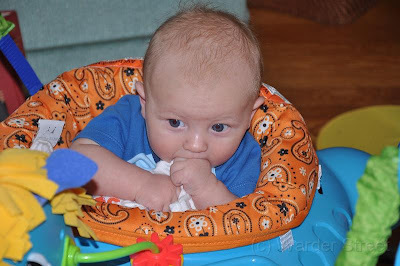 He has also learned how to squirm. When he's sitting in my lap and he wants to move he'll arch his back and try to wiggle out of my arms. Scary but cute. He also loves to stand up. We've actually put him in his jumperoo for a few minutes every day. He doesn't quite get the point but he enjoys playing with the toys on the horse. 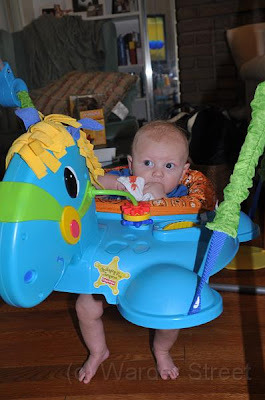 I really think that in just a few short months he'll be pulling himself up and starting to walk. My kid wants to move!